New! “Learn ’em Forwards and Backwards”, a new, free, automated system to bring your basic multiplication and division skills up to full mastery, quickly and easily. This program identifies your weak spots and concentrates your efforts where they are most needed. Nothing to download or install. Use it right here. The Home Study Companion series covers Algebra 1 through Calculus. Until now I have not known what to recommend to families who were looking for a Prealgebra course that would best prepare them for the HSC Algebra 1. None of the textbooks or packaged courses I have seen have stood out to me as particularly strong. That has now changed. 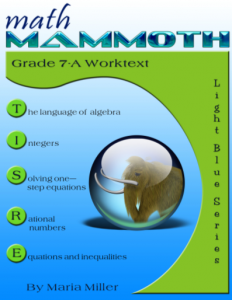 I now recommend the recently completed Math Mammoth Grade 7 worktext, by Maria Miller, as a Prealgebra text. The 2-part text is billed as Grade 7A and 7B, rather than “Prealgebra,” but in fact it covers everything one would look for in a Prealgebra course. If you pay attention to the Common Core Standards, this text covers Grade 7 standards, and a few standards from Grade 8 (slope, linear equations, the Pythagorean Theorem). I frequently describe Prealgebra as a “holding pattern” for students who have completed arithmetic but who may not be maturationally ready for the more abstract level of reasoning required in algebra. The content of the course consists of an introduction to many algebraic topics that will be covered in more detail in later courses (e.g. expressions, linear equations, proportions, the Pythagorean Theorem), along with some arithmetic (ratios, integers, percent), and some topics from geometry, probability, and statistics. Even though one might see Prealgebra as superfluous, in terms of the redundancy of topics, the need for this extra stage of preparation should not be dismissed lightly. Highschool math introduces a lot of new topics quickly. Prealgebra provides a first introduction to many new ideas that can make the transition easier. Students frequently enter high school with deficiencies in their arithmetic skills (multiplication tables, arithmetic with fractions, decimals, and percents, etc.) that slow them down and interfere with the learning of new material. If your child needs review on arithmetic topics, Math Mammoth has a series of topical review worktexts that could be very helpful. (That is also why I created “Learn ’em Forwards and Backwards,” a multiplication and division tables mastery program, available free elsewhere on this site.) Prealgebra is the time to “polish off” all of the basic skills to a level of mastery. Prealgebra is also a time for an introduction to new types of numbers, such as the irrational numbers. These are numbers that cannot be expressed as fractions and turn out to be infinite, non-repeating decimals. The ratio of the circumference to the diameter of a circle, π, is a good example. It is mysterious to students at first, because it is generally the first example of a number they have encountered that can’t be written down completely, but only approximated. Square roots that don’t come out evenly are another example of irrational numbers. The quality of mystery that surrounds these numbers may (hopefully) persist and even grow, but it is important to become comfortable working with these kinds of numbers. Awe and wonder are good, but total mystification can lead to confusion and math anxiety. Demystifying irrational numbers, and learning to work with them computationally, require time and attention. These will be covered in detail in algebra and beyond, but Prealgebra is a good opportunity for a gentle introduction. Maria Miller handles these topics well. As an example, look at the introduction to square roots and the Pythagorean Theorem in Chapter 9. The topic involves working with square roots, the radical symbol for square roots, the Pythagorean Theorem (for finding the hypotenuse of a right triangle or the diagonal of a rectangle), which is one of the important applications of square roots, and finally proving the Pythagorean Theorem. She starts the chapter with numerous internet links to tutorials, games, and puzzles related to square roots, links to her own video lessons on the Pythagorean Theorem, applications to pyramids, maps, and Pythagorean Triples, and an extension of the Pythagorean Theorem to 3-D. She ends with links to web pages with animated proofs of the Pythagorean Theorem and even a collection of over 100 proofs of this famous theorem. There is plenty of material here for exploration. Diving into the chapter itself, she provides definitions, illustrations, and memory tricks to help understand and remember the meaning of square roots. She comments on how to find square roots with various calculators (not all scientific calculators work the same), solves equations that require taking square roots, and discusses what happens when you try to take the square root of a negative number. She provides ample illustration problems, ample practice problems, a variety of real-world applications, and ends the section with a slight extension of the idea as a puzzle problem. In short, she approaches the topic from all sides, with the goals of stimulating interest, understanding, recognition of applications in the real world, and computational fluency. I have commented elsewhere that one of the characteristics I like about the Foerster algebra series and the Chakerian, Crabil and Stein geometry text is that they have a definite “sense of authorship.” In using these books you feel you have met the authors. They are not dry, lifeless entities created by a committee. Someone who knows and loves mathematics wrote these books and communicates through them. Maria Miller’s books share this quality. I am not selling the Math Mammoth series, but I wanted to put a link here as a suggestion to those looking for a good Prealgebra course. The course comes as a student text, divided into Part A and Part B, a solution key, unit tests, cumulative tests, and supplementary software. There are a number of probability demonstrations written for spreadsheet software, such as Excel or Libre Office (free) which are platform-independent, and a bonus software pack for Windows only. The text is available in printed form or a completely electronic edition (pdf files). Go to the Math Mammoth website for more information.